The windows in your home provide so much more than a nice view and Sudbury window cleaning will make sure you are getting the most out of these fixtures. The winters in Sudbury can range from mild to frigid and the condition of your windows can make a huge difference not only in heating homes but the bills that go along with it. “How can window washing save me money on heating bills, you may ask?” Easy! Glass is a porous material and if debris or dirt is left on its surface, it will absorb into the surface and begin to decay. When windows, along with the area along the glass, becomes vulnerable, outside air is able to penetrate the seals and enter your home. The colder the air inside, the more heat you will need to keep your home comfortable. The same can be said for summer months, as warm air is able to penetrate your windows, the need for air conditioning increases as well. As seasons change, the condition and quality of your windows play an important part. Using Sudbury window washing as a method of prevention will help reduce the risk of or at least prolong the need for window replacement. Gorilla’s Sudbury window cleaning techniques involve being up close and personal to ensure the most efficient results possible. Our Gorillas use a variety of specialty tools in order to achieve the best clean possible. 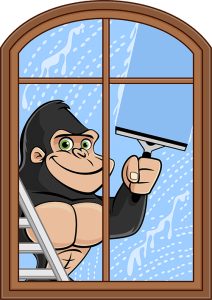 Our Gorillas are also available to carry out cleaning of window frame and sills up to three storeys. This allows home and business owners a clearer insight into the condition of your windows.